Beginners Arduino Circuitry Coding Class! Contrary to its sound, Arduino is not a fancy pasta, but an open-source (available to review, edit, and share) electronic prototyping platform. It enables users to create interactive electronic objects based on easy to use software and hardware. The Arduino language was originally developed for students who did not have a background in programming or electronics. Arduino boards read Arduino language inputs such as a finger touching a button and translate them into outputs, such as a motor turn or a light lighting. Due to its accessibility, Arduino has been used in a broad range of applications from hobby arts and crafts to professional industrial designs. 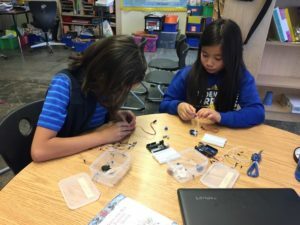 In mid-Spring, 2018, students learned the basics of Arduino programming with a variety of tools; from computer based coding, to physical Arduino Uno boards. 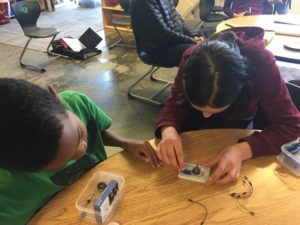 Over the course of five classes, students were taught simple coding commands to enter into Arduino programs that enabled changes in objects such as: flickering lights, sound emissions, and even the moving of a robotic arm. One of the projects was a light theremin – an instrument that makes a sound, the pitch of which changes based on varying light levels falling on a sensor.The more light exposed to the photoresistor, the higher pitched the sound produced. Light exposure was controlled by blocking the sensor with our hands. Many spooky movies use light theremins to create mysterious alien sounds, but ours was more similar to that of an incessant fly. Arduino projects were demonstrated at the monthly Club meeting. The 4-H values that we practiced included: teamwork (Heart), tinkering with wires and the Arduino board (Hands), and coding the programs (Head). We had fun learning about this cool tool!